Why is it that even if you own the toughest, bulkiest safe, you are still in danger of being robbed? Or how is that mother nature can penetrate the most secure gun safe organization and cause damage where we least expect? One of the standard locations for a gun safe is in the garage, but is it as safe as one may assume? Is placing your gun safe in a garage a sustainable, long-term decision? Let’s look at both sides of keeping your gun safe in the garage to help you decide if it the best location for your safe. The first upside of storing a gun safe in a garage is that it is more aesthetic than looking at a gun safe every night you go to sleep in the bedroom, placing it in the basement, or in the casual living room. The garage also offers easier and more effective access, regardless of if it is attached or detached from the house because it is more suitable to get your long guns directly from the garage than carrying them around your domicile. Although seemingly contradictory, the garage can mean less, or more, chances for a theft. This location is less expected and anticipated by burglars, at the same time, if detected, is more easily accessible. However, a good spot and a solid installation of your gun safe in the garage will deter all mischievous intent. The garage also means higher chances for flooding and/or damage to your safe due to higher humidity, but using the proper tools and undertaking the necessary steps (that we will elaborate on) to prevent all of this, will imbue more trust to confidently keep your safe in the garage. Easier access and a sturdy installation of your gun safe mean more convenience for you, but in terms of location, an inconvenient location of your gun safe often means better protection. So, the best place to anchor it would be in the corner of the garage, not in the center or near a door or a window. With this, you will prevent someone spotting the exact location of the safe, as well as viewing you while you remove and/or organize your firearms. It's important that it is out of reach and unrecognizable to burglars, as well as to children and unauthorized family members. Moving the safe can also be very demanding and when accomplishing this task, we need to prioritize safety, but once the ideal place is found and occupied, the installation isn’t that hard. To have your gun safe firmly attached to the ground, you need to bolt it down to the four corners of the concrete slab. For additional safety, you can build a wooden room around it, to secure it and conceal it even better. Do You Need a Dehumidifier if it's Kept in the Garage? It's important that your safe is protected from moisture underneath, inside, and outside the safe. For protection underneath against rust and to increase the longevity of your safe, you can place either wood or some type of membrane to keep moisture and rust away from the base of the safe. However, in high temperatures during the summer, it's very important that you keep your safe protected from all the heat and humidity. This is the time when the interior and exterior of your safe depend on a dehumidifier. Desiccant gels and GoldenRods by themselves are never efficient enough to keep the moisture away and prevent rust in the long run, so use the power source in or near your safe and connect a dehumidifier to ensure indisputable protection. This GoldenRod dehumidifier uses electric, sealed components to spread dry, warm air around the storage unit and as a result, have your shooting equipment protected from moisture and prevent condensation for as long as you need. The inside of your safe remains slightly more heated than the outside environment and once the dehumidifier is turned on, you won't need to worry about emptying, refilling it, or baking it dry. It comes in four different lengths/sizes, each with an appropriate amount of power. It needs to be laid down horizontally at the bottom of the safe, takes up very little space, and yet is incredibly effective. The circulating, optimal heat doesn't have much of an effect on stored ammunition. You also need an electrical connection inside the safe for this dehumidifier, or you can drill a hole to connect it to an exterior power source. A regular check-up of your safe's temperature and humidity levels is as important as the amount you spend on your valuable firearms and gear. Nothing prevents damage better than having the right tools to maintain the good looks and functionality of your guns. If the water vapor in your safe is stabilized to a relative 50%, this condition presents no danger to the durability of your guns. Additionally, a temperature of around 70°F (21°C) is considered to be optimal for gun storage. However, as always, distinct equipment has distinct requirements, so it is important that you know the specific conditions in which your equipment will be well-preserved and protected. That is why a device inside your safe that indicates current air and temperature conditions with accuracy is essential to exemplary maintenance of your enclosed gun storage unit and gear. 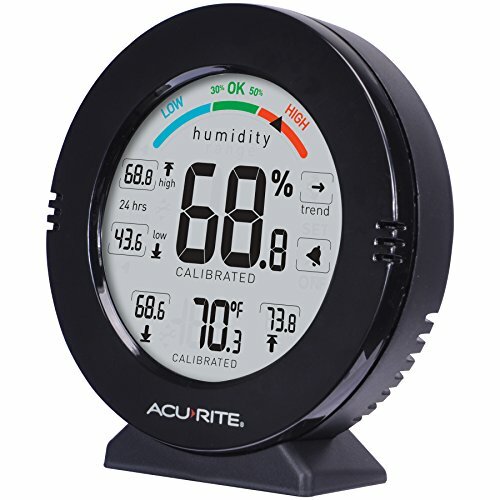 This compact AcuRite humidity and temperature gauge provides accurate and easy-to-read information on the air conditions inside your safe, vault room, or any confined area. It identifies variations and updates data every ten seconds for the most precise monitoring and control. 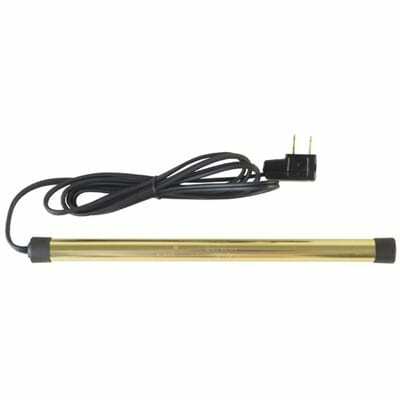 After manual calibration and individual, personal customization, this sensor has colorful flashing and audible signs and warnings when the humidity levels exceed or drop outside the ideal, customized range. However, while the alarm can be switched on and off at any time, it does not alert on temperature levels. It relies on ambient light and doesn't come with a back light. This unit can be placed on a tabletop, hung on a wall, or attached anywhere thanks to the magnets at the back. The batteries are strong and durable, and another positive is that it has one year warranty. A gun safe in a garage can be a great idea if you want to avoid taking up space in the more common areas of your house and provide additional protection for your valuable items, as well as your entire family. Besides being somewhat challenging and requiring regular check-ups, monitoring, oiling of your equipment (something we do anyway), and purchasing necessary tools like the ones we reviewed, one of the best locations for your safe is definitely the garage. We hope to have provided everything you need to know about keeping your safe and guns good as new in the garage for the entirety of their life and yours.